Reputation Manager, Andy Beal, took to the stage on Wednesday morning at Clickz, to share his lessons for Reputation Management for brands. 83% of businesses in next 5 years will have a reputation management issue. 87% of consumers tie reputation of the CEO to the reputation of the company. 97% of consumers do online research to determine if they buy a product or not. With this in mind, Beal offered 15 simple lessons for brands so you can avoid becoming a statistic. You only have one reputation. There is no longer a distinction between your personal and professional life, so everything you say is now seen as representative of you as an individual and a professional. A recent example that made the news in America, involved Phil Robertson from Duck Dynasty. Robertson’s homophobic comments in a personal interview reflected badly on the A&E channel that produces his television program. The show was almost cancelled based on this. As our digital and ‘real’ lives become more entwined, it is increasingly likely that any bad behaviour offline will soon find it’s way online. This is especially true if you are a person of influence or fame. There are almost too many examples of this to mention, every other week there is a tabloid rush on the latest stripper with a connection to a politician. Cory Booker, Mayor of Newark’s recent DM tweets to Lynsie Lee are just one of many recent examples. American chef Paula Deen recently made headlines for all the wrong reasons, when it came to light that she had used the N-word many years ago. She lost sponsorship deals and her reputation is almost not irreparably damaged. The moral of this story is that murky moments and mistakes may well come back to haunt you – try to avoid causing offense in the first place. Easier said than done. A UK driver (from Norfolk – where I’m from. The Shame) managed to get herself into a lot of trouble, but not for her original crime, that of knocking over a cyclist with her car, but because she then went on to twitter and bragged about doing it. The 140 characters above got Emma led to a reply tweet from the police, which led to a court appearance, points on her license, a fine and a bad reputation. Even tweets or posts that you send privately have a way of leaking out, particularly in this instance when the tweet in question is so extremely callous. Any privacy precautions you are taking are token at this point so it is much wiser to simply avoid saying anything offensive. Mitt Romney? A likeable, successful Presidential candidate running against an incumbent President weathering the worst financial recession since the 1930s – the 2012 election was arguably his to lose until a video was released of him famously dismissing 47% of the American people. The rule here is part of the blur between private and professional issue mentioned already, however to recap, you are always, always being watched and, consequently, judged. It is now incredibly easy to record audio, make videos and generally get people into trouble. Kate Moss’s cocaine scandal in 2007 is another example of someone operating in what they thought was a trusted environment and being left in a rather compromising position. It is still incredible just how many companies encourage their staff to share their work at the company via their social networks, however there is little guidance or training about just what is and what is not appropriate. These days there is always the added complication that even offline gaffes can quickly find their way online and make you notorious for all the wrong reasons. 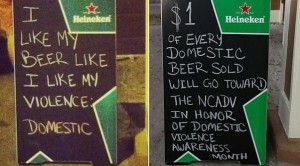 Minibar in Austin, TX, did remedy the first error with donations to domestic violence charities but it is still unfortunate that it was allowed to happen in the first place. Examples such as this highlight how important it is to make sure you staff have a robust sense of their role in representing your brand in their lives at work, offline and online. On this theme, the familiar “views are mine and not that of my employer” might be legally binding however other readers and potential customers might not see it that way. As previously stated, your views will automatically be tied back to your company. As Justine Sacco and Pax Dickinson found out the hard way. 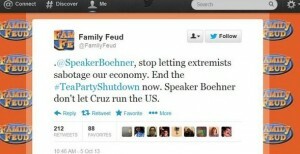 Family Feud made some waves recently when a recent tweet was claimed to be the result of hacking. Beal called this into question and thinks it is perhaps more likely than an employee accidentally tweeted from the wrong account. It does lead to the intriguing notion that “I was hacked” is the new “ I was drunk”. Based on the tip above, it can be all too easy to switch between accounts and then accidentally post something to the wrong account. 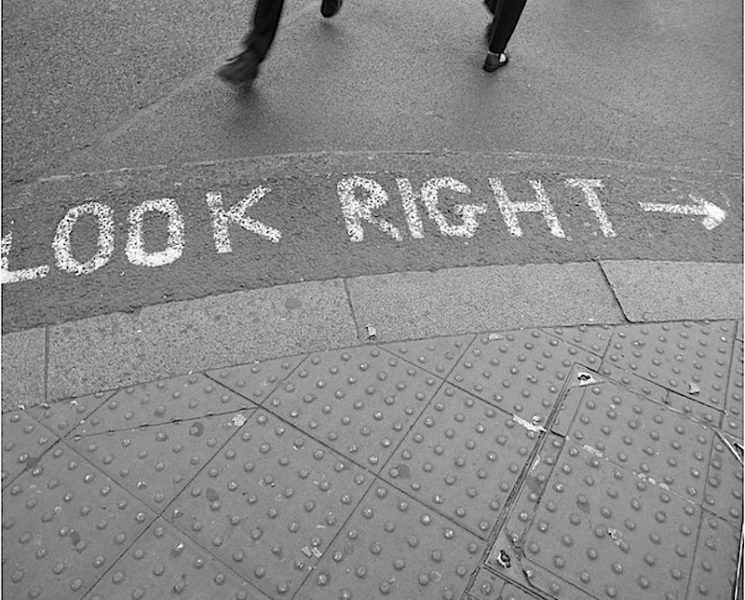 Tools such as HootSuite, whilst very valuable, make this sort of mistake more likely than ever. 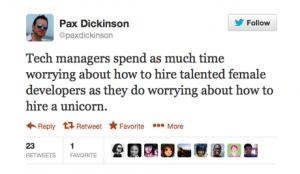 As an employer, accept that these mistakes happen however factor in the ‘rant-proclivity’ ™ factor into it when you are allocating social media responsibilities. For whilst you definitely don’t want inappropriate content appearing on your social channels, even your employee’s personal social channels can be tied back to your brand. With this in mind, any public ranters, whilst completely entitled to their own opinions, might not be the best fit for your social media efforts. As with content marketing and production, in terms of Reputation Management it is vitally important to understand your customers and their interests. 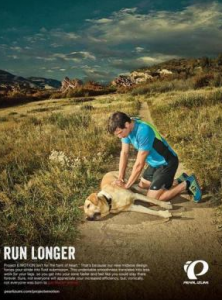 This print ad for Pearl Izumi upset a lot of their animal-loving customers. The uproar was such that it attracted criticism from animal rights groups, an entirely new community, who now have a negative impression of the company. Brands often make the mistake of monitoring their accounts during the business hours of their country, but fail to take into account that social channels are never closed for business. This can lead to the proverbial storm developing overnight or, worse still, over a weekend, when the accounts are not managed. The trick to getting around this, not by having 24 hour support staff, that is not realistic, but there has to be a system in place to monitor alerts and mentions, on rotation so any issues that do come to light can be addressed quickly before it gets out of hand. British Airways learnt this the hard way – they didn’t respond to tweet from @HVSVN who then, in a clever moment of revenge, decided to promote the tweet. His tweet went viral, the mainstream media picked it up and when BA finally responded as follows, it only fanned the flames. Along the same lines, automated tweets or scheduled posts are a reality for most companies planning their social content however it can backfire and when it does, the results tend to be spectacular. The golden rule in this instance is to cancel any automated tweets the moment you find out about any potential PR issues. Tesco discovered this at their cost when this tweet was posted at the same time as the company was under fire for the horsemeat scandal. It is important to show some restraint with anniversaries of historical events. 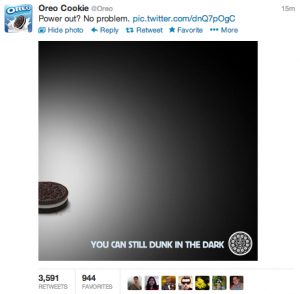 The pressure to produce timely, topical content that also ties in with your brand is immense as the rewards can be great, as Oreo found out during the superbowl of 2012 with this clever, fun, simple little gem. 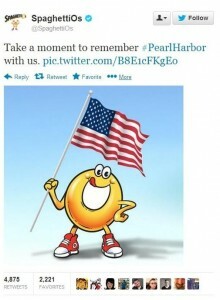 However, for success stories such as this, there are too many examples of brands trying to seemingly cash in on more somber events. This image, whilst sincere, just comes across as a little crass. If you are in any confusion about how to commemorate a historical event, the best answer might be to say nothing at all, or, if you feel strongly, avoid images and keep it simple, along the lines of ‘our thoughts are with the families’. Sincerity rings out in these instances and you want to make sure anything you express is honest and appropriate. Learn from Samsung’s recent PR fail, when it came to light that they were hiring people to write fake positive reviews of their products and, more damningly-still, fake negative reviews of HTC products. There is no need for tactics like this and invariably the truth will come out at some point, as in the case for Samsung who ended up with a fine for their troubles. Flying counter-trend from the message of The Lean Startup, it is important to do your utmost to release a finished, working product that can cope with the demand. The recent debacle over the Healthcare.gov website is a good example of the damage caused by an imperfect product. Unfortunately you only have one chance to create a positive first impression and if that is not positive, your potential customers are likely to go elsewhere to find what they need. Who is handling it well? Amongst all of this negativity, there are a number of brands who understand the importance of their reputation and are willing to defend it. Take United Airlines, formerly notorious for crushing a musician’s guitar, recently did the right thing with a ticket price glitch. Users to the site realized that flights to Hawaii were selling for ~$ 10 each. Rather than cancel those tickets, United tackled the issue on Twitter with the following tweet. United had clearly learnt from their previous mistakes and also had a sense that the financial implications of this error was lower than the cost of angering customers over their own internal error and potentially turning those people into detractors. The TL;DR of Beal’s keynote is that whilst the mistakes listed above are largely obvious, it is worth going over them and making sure everyone in your company understands their importance. The task of reputation management is largely thankless and invisible, until it’s too late so take the time to review your social media policies now, to make sure there is a system in place to limit the damage. If all else fails, avoid twitter, as that seems to be the source of the majority of these errors. Sarah Kershaw is a search analyst based in New York who engages in freelance writing in her spare time, writing about trends in digital marketing, the future of news and fine art. As a search analyst, Sarah is interested in UX and IA and tends to get very animated when talking about fonts and colours. This post was written by an author who is not a regular contributor to State of Digital. See all the other regular State of Digital authors here. Opinions expressed in the article are those of the contributor and not necessarily those of State of Digital. A great recap of my advice! Thanks for sharing! Thank you Andy! Glad you liked it, it was a great presentation – eye-opening and entertaining. I’m just embarrassed that the road-rage driver who knocks over cyclists harks from my county of origin. The shame of it! What is State of Digital? In a fast-changing digital environment, it is hard to keep up. Knowing what are the strategies and tactics you need to deploy to become better at your marketing is not an easy task. State of Digital aims to help (digital) marketers from every level. Help them find their way in this changing environment. By sharing the latest strategies and tactics. By offering training. Using industry experts, State of Digital tries to help you become a better marketer.